Kensington Prep recently unveiled its ground-breaking new learning facilities as part of its £2.7 million ‘Creating Spaces for Growing Minds’ building project. The Explore Floor – an interactive, multipurpose learning space, designed to support and encourage independent exploration, self-directed learning and collaborative work – will be a key part of the facilities. Ken Prep called in CDEC to advise on this innovative space, the type of which had never been created before. Key features essential to the design included the need for multi-screen, multi-touch technology to allow students to collaborate and work in small groups; the ability to utilise projection in a number of ways including on to the floor so classes could sit down and use the technology in a three-dimensional way; and the need for radio and television facilities in a separate multimedia studio featuring professional mixers, microphones, headphones and more. 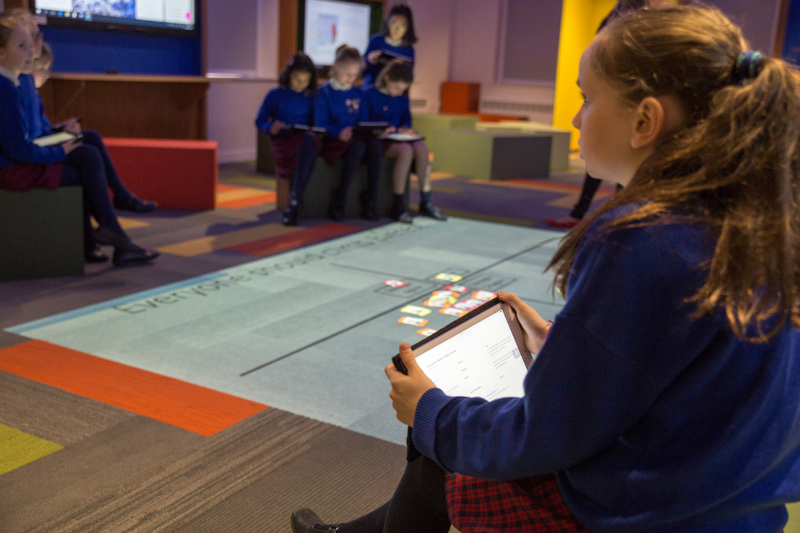 A whole host of technology was integrated into the room including 55in and 70in Promethean ActivPanels – fully connected interactive displays that provide tablet-like functionality for the classroom – and an NEC PA522U Full HD projector for floor projection. From the moment students walk into the room, they interact with technology, scanning a QR code by the door which allows them to access the information they need for the lesson on their iPads. 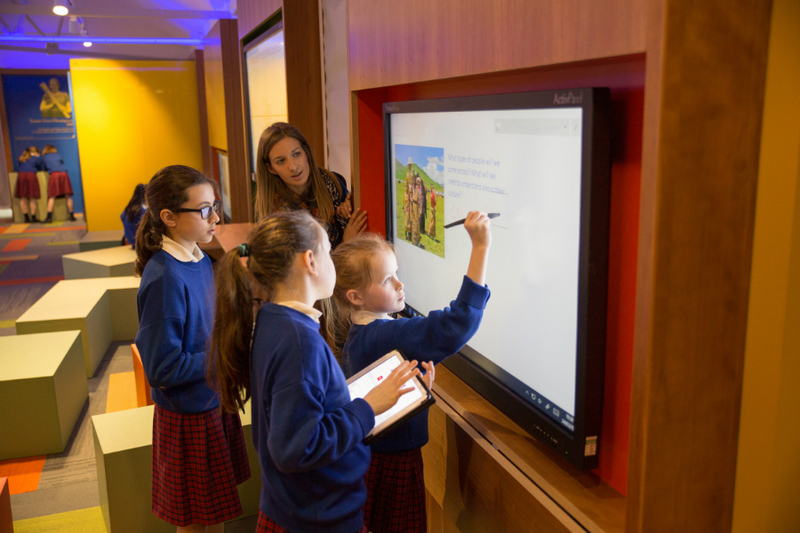 Touch is also a key feature of the room and the 4 55in and 2 70in ActivPanel screens are all multi-touch allowing students to research and share ideas easily. To assist with this, CDEC enabled multiplexing across the screens, so if a student is working on one screen it can be shared with all. Similarly, in group working, the project can come to the student rather than people having to move around, reducing disruption in the class and saving time. All technology in the room, including blinds and lighting, is controlled via iPad, ensuring teachers have an easy-to-use and recognisable control interface. This was central to the brief to ensure strong take up of the room. Since completion a room booking system has been introduced for the Explore Floor as it has proved so popular with teachers. 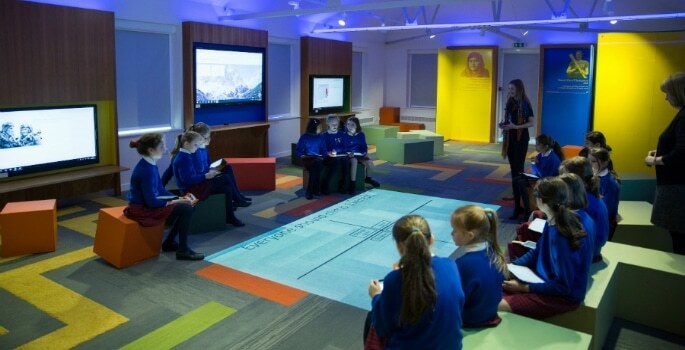 The floor projection, along with the ability to control windows, blinds and lighting at the touch of a button, means it is incredibly easy to create an immersive, atmospheric learning experience for students focused around the central projection. They can be introduced to the theme of the lesson here before moving into groups to research topics further independently. Although it is integrated within the Explore Floor, the studio is still its own identifiable isolated space where students can carry out independent work while being observed by the teacher through the glass. The technology in the studio creates something that many other schools don’t have and the opportunities it affords have been integrated within lesson plans. For example, when students carry out independent research in the Explore Floor, they can take this further to investigate a topic and present it on air, rather than just in front of their class, giving them the professional experiences of being a journalist or a news presenter.